This is a really good idea but I was having a hard time deciding who to write about. As I explained last year I didn’t really have any inspiring female teachers or role models growing up. I make no apology therefore for turning to the one medium that was showing me women in scientific roles (back in the dark ages before Twitter and blogging): TV, and more specifically, a program from around the turn of the century called Rough Science, which dropped an intrepid group of scientists into an exotic environment (Zanziber, Colorado, New Zealand, Carriacou for example) and challenged them to use their science know-how to solve a variety of problems. One of the best things about the program was that it included a mix of male and female scientists, and showed them all having ideas, building stuff and generally making science look like a lot of fun. The one I remember most is Kathy Sykes, a physicist (and now Professor of Sciences and Society at Bristol University) whose irrepressible joy in what she was doing really shone through. Anyway, when I heard about Ada Lovelace Day I have to confess that my first thought was that I couldn’t think who to write about. It’s not that I didn’t have teachers at school or university who inspired a love of science in me – it’s just that they were all male. This had never occurred to me before (and it’s not necessarily a bad thing; I never lacked encouragement, or was made to feel that studying science was a strange or unusual thing for a girl to do). However, it wasn’t long after this that I realised that there was something in my childhood which helped change the way I think about scientists, and female scientists in particular, and I thought that’s what I’d share with you today. In 1991 the BBC broadcast a children’s drama series called Dark Season. It was notable for two reasons – it was one of the first major TV appearances for a young Kate Winslet, as well as being, I think, the first show to be written by Russel T. Davies (who would later, massively successfully, revive Dr. Who). The first three episodes focused on the plot by an Evil Corporation, led by a Mr Eldritch, to take over the minds of school children using mind-controlling computers. Of course, a band of plucky kids figure out what’s going on and try to stop them. The Evil Corporation know that the only person who can stop them is a Russian computer scientist called Prof. Bejinski, and by the final episode they’ve managed to capture him as the plucky kids couldn’t warn him in time. “You’re our prisoner Professor! Nothing can stop us now! !” All that over the top villain stuff. But hang on, the Professor doesn’t seem bothered by this. In fact it seems to amuse him. “No, not true”, he says, “for Prof. Bejinski is my WIFE”. And the scene immediately shifts to his house where the newly revealed, female, professor is getting out her computer and preparing to save the world. “Oh”, thought 10 year old me, “women can be professors too”…. Now, I’m not claiming that I became a professional astronomer because of something I saw on TV (or even that my ‘inspiring woman’ is in fact Russel T. Davies), but I think what I’m trying to say is every little thing helps when you’re trying to change attitudes. When someone is referred to as ‘Professor’ do you immediately assume they’re a man? Dark Season helped me to see that scientists come in many different shapes and sizes and I should never assume otherwise. Sign up for Ada Lovelace Day! Quick post (and shameless plug) to try and get some more people to pledge to blog about the achievements of women in science and technology on 24th March – designated Ada Lovelace Day. Sign up at http://findingada.com. The organisers are aiming for 3072 pledgees; they currently have 1123 and there’s only two weeks to go hence the appeal! 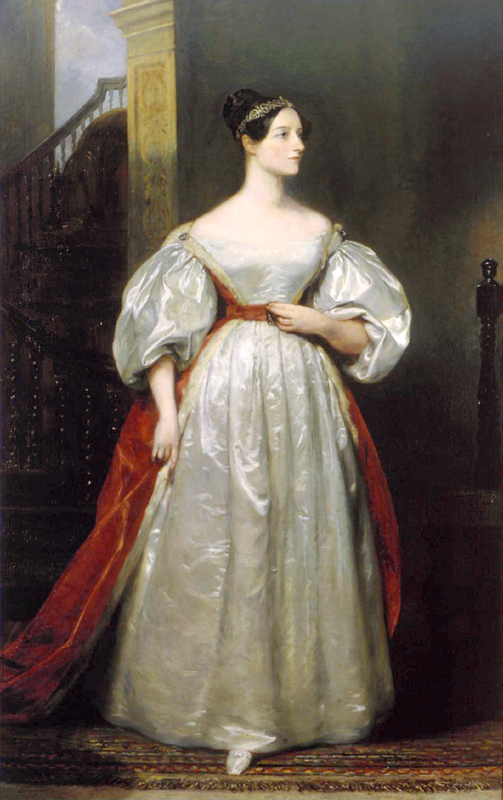 Ada Lovelace, born in 1815, is widely credited as the first computer programmer (even though the ‘computer’ she wrote a program for – Charles Babbage’s Analytical Engine – was never actually built). She was taught mathematics as a girl to combat any poetical tendencies she might have inherited from her father, the “mad, bad and dangerous to know” Lord Byron! Unfortunately she died when she was only 36 so she never got a chance to develop her ideas further. However, she lives on (and, alongside Babbage, fights crime) over at the wonderful 2D Goggles. Find out more about the motivation behind Ada Lovelace Day here. Oh, and check back here on 24th March for my contribution!